I've been a bad girl and very lazy with reports from the last trip, but today I sit and write for you. :) Next week, I'll share reports from Slovakia but today I'll show you the souvenirs I collected in some of the countries. On this journey it was challenging to collect things because we were in remote areas and on the road most of the time, so access to shops was limited. Still an opportunity to collect some treasures along the way. (1) Small wooden figurine from Estonia. You see the lovely wooden woman is holding the Estonian flag. (2) Rock from the Baltic Sea in Lithuania. 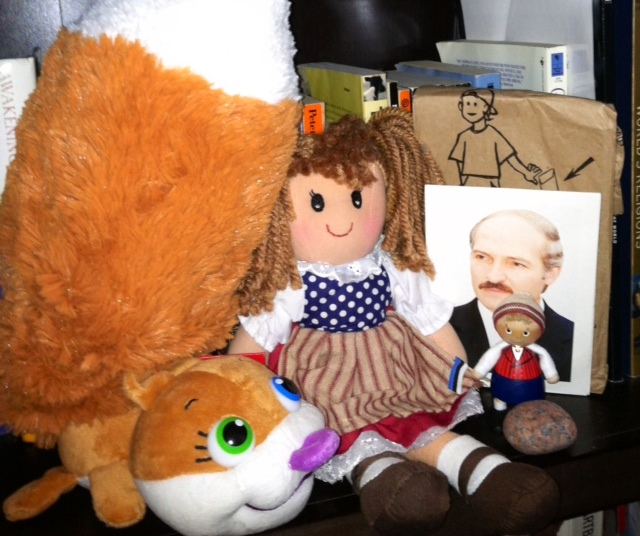 (3) Cute red, white and blue doll from Bratislava, Slovakia, the only touristy city in which we stopped. I like her pigtails. I used to wear my hair like that as child and sometimes even as an adult on weekends for fun. Here's a photo from the old days. Yes, I used to be a cheerleader on my cousin's football team, waving my pompoms, doing cartwheels and jumping up and down!! (4) Nice "poop n scoop" bag from a walkway in Bratislava. Very clean city, with lots of trashcans and facilities for pet owners to take care of waste. I've never seen such a decorative bag for this purpose. They are common in America, but usually just ugly brown bags. (5) Cute squirrel given to me by travel companion in Minsk. 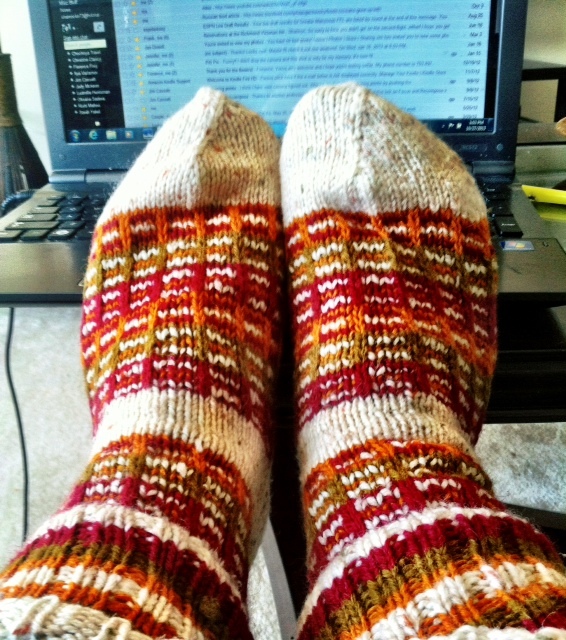 (7) My favorite - handmade socks from one of the cute old ladies at the Latvian market. Colorful, cozy and warm for winter. I usually collect Christmas ornaments from each country but didn't find any on this trip and have none from Russia. A real pity! Next weekend my family and I will go to the Christmas tree farm and cut our trees. Maybe I'll write a report about it. What's your favorite souvenir? P.S. : Today my 100th post!! Thanks to all my readers for their dedication to my blog and insightful comments! I also collect magnets from most trips, common souvenir. :) These knitted socks are wonderful and I also like knitted or crocheted hats but didn't see any at the market. Unfortunately, I have no sewing ability or I would make them myself. Do you have any American stamps? If not, I can send you some. Just write me your address in personal message. We have awesome stamps in the U.S., very colorful and tons of variety. Now all of the holiday stamps are out for Christmas. :) A lot of my relatives work for the U.S. Postal System. Nice souvenirs! But why Lukashenko?? Do you like him as a leader of a country? Shannon, do you know how to knit? Is that craft common in America? i like cards with views or sights. or guide-books. I also collect postcards and, when possible, I take the time to send them to close friends when I travel. I still believe in the value of a handwritten note. :) I have a lot of these cards from various Russian cities. Some are hanging on my refrigerator. Памятный сувенир из поездки в Израиль 10 лет назад. Попала туда случайно, на обучение. Same as No 7, bought a couple of years ago in Lithuania near Trakai Island Castle. 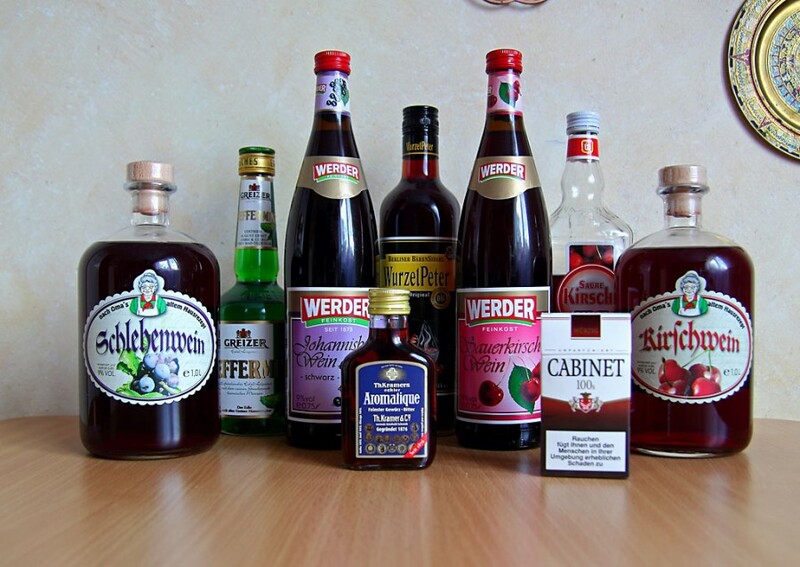 Souvenirs from Germany, Potsdam. Summer 2013. Now there is only a picture :(. Wow! You drove to Germany? How did you bring so many bottles back? I bought a bottle of Estonian vodka on the journey, but unfortunately my travel companion dropped the bottle and it broke before I could even taste it. Christmas ornaments for me too) I call it " My travel Christmas tree". I was just driving around my parent's neighborhood and a lot of people already have their Christmas trees up and lit through the windows! It's too early! We have not even celebrated Thanksgiving yet. :) My favorite ornaments are from Vienna, Austria. And as for handwritten letters – recently one my friend asked me to write her a letter, which I did with great pleasure for the first time in 10 years or more, but there are already 4 weeks that my letter travels from Germany to Russia… :( Discouraging. I always save some bank notes as well from most countries, and various tickets to places I visit. You're right, it's a great way to remember everything you saw during a trip. Oh, Russian post is a nightmare! 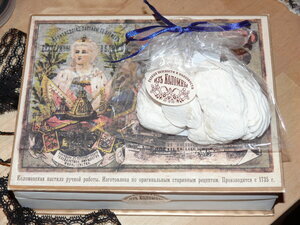 Usually it takes at least one month for my shipments from the U.S. to be delivered to Russian friends. Germany is closer so it shouldn't take as long. :) I really like receiving handwritten postcards or notes from friends! I save all of them in a memory box. Which photo? 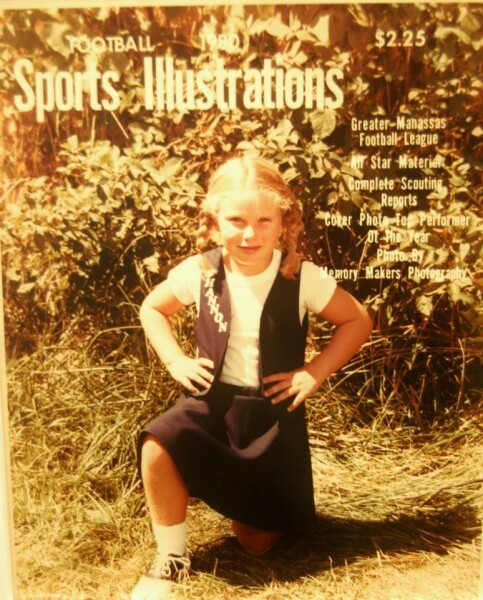 The one of me in my cheerleader outfit? Yes, it's embarrassing I know. :)) You don't miss Luka or your native Belarus at all? There must be some comfort from home that is missing in Buffalo. Thank you! исчо, this word doesn't translate? What does it mean? We have no Christmas traditions. This is common drunk day after New Year. "Common drunk day." Sad. :(( But Russians celebrate the holidays, I see all the decorated trees and lights in Russian cities. The socks look good. In Russia they don't really celebrate Christmas. They have their own version of it on the 7th of January, but on the whole Chistianity didn't really take root in Russia. A polish catholic from Western Belarus? Ha-ha, portrait of Lukashenko is amusing! Congratulations with the anniversary post! He's a pro at the dictator pose. :) Thanks! I enjoy writing here and communicating with everyone.